It’s been over 30 years since Tide changed the way we have done laundry with liquid Tide –but Tide has innovated again with its newest laundry innovation, Tide Pods. Tide Pods are a multi-dimensional laundry detergent that looks different than any other liquid or unit dose detergent in the market today. What makes Tide Pods work so well? The three chamber design allows the product to brighten, fight stains and clean – delivering a superior clean you can only expect from Tide. What’s more is that the product features a best-in-class film that dissolves and works effectively in all water temperatures. Simply place a pac into the drum of a front or top-loading washing machine before adding clothing – there’s no need to measure, pour or clean up messy spills. 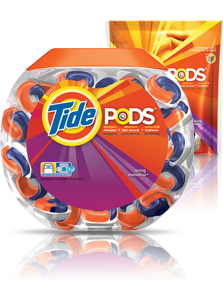 The product’s much-anticipated nationwide rollout is March 2012, Tide Pods have hit stores everywhere. They are available 40 count, 57 count and 77 count packages. Tide’s reinventing the way you do laundry! How do I use new Tide Pods 3-in-1 detergent? Just toss Tide Pods into the drum of any washing machine before adding your clothes to wash any size load. Tide laundry detergent pacs clean, brighten, and fight stains so all your looks pop. With 3 MESSY teenagers in my house, I am looking for ways to make laundry easier. With the NEW Tide Pods it has made my life so much easier. Just toss a Tide Pod in and go about my many other chores for the day. Before, I would have to look at ever piece of clothing before I threw it in the washer and apply stain remover to the stains and check it again at the end of the wash and see if the stain had washed out. Usually a stain would take 2 or 3 washes. With the Tide Pods I just toss all the clothes in and the stain remover finds the stains and removes them~ woohoo. Not only are the clothes clean and free of stains but they are brighter!! The clothes were so clean and bright that my kiddos noticed the difference! My family and I give the Tide Pods a 5 out of 5. The freshness and the stain fighters are awesome! Thanks Tide for a great way to do laundry! disclosure~ I received 3 sample packages of the NEW tide Pods in order to write my review. All opinions are my own.